Tamron’s updated G2 (Generation 2) lenses have been enjoying the limelight recently, but this first edition 100-400mm is equally impressive. It packs a real performance punch into a tough but lightweight build, and at a relatively lightweight price. 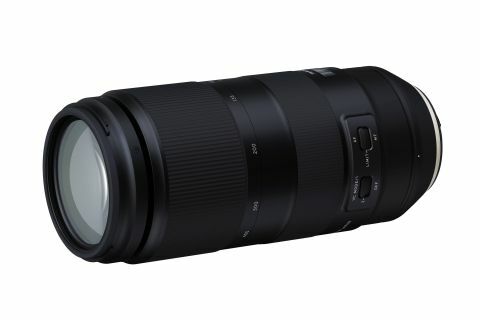 Following in the tracks of the Sigma 100-400mm Contemporary zoom, this full-frame compatible Tamron lens for Canon and Nikon DSLRs aims to pack premium performance into a relatively compact and lightweight build. Measuring 199mm long and weighing in at 1.1kg, the Tamron is easily manageable for a super-telephoto zoom, and light enough to use for prolonged periods of handheld shooting. As usual for this type of lens, the physical length nearly doubles when zooming to the longest focal length, but focusing is fully internal. Despite the reasonable asking price, build quality is excellent. The main section of the outer barrel is made from magnesium alloy, and the lens features weather-seals and a fluorine coating on the front element. Nano-structure coatings are used to minimize ghosting and flare, while an LD (Low Dispersion) element is included to boost sharpness and reduce colour fringing. Handling is very refined, with a smooth-action, precision feel to the zoom and focus rings. Our review sample didn’t suffer from any zoom creep whatsoever, but a zoom lock switch is fitted nonetheless. Additional switches are on hand for dual-mode VC (Vibration Compensation), featuring static and panning stabilization options, and for AF/MF/Limit. This is cleverly implemented, the ‘Limit’ position enabling the opposite sector of the autofocus range to be locked out, depending on whether a short of long focus distance is in use when the switch is activated. The ring-type ultrasonic autofocus system is particularly speedy, thanks to dual microprocessors and built-in digital signal processing. It’s also whisper quiet. As usual, you also get the benefits of manual focus override and a focus distance scale beneath a viewing panel. Helped by a highly competent stabiliser, which gave an effectiveness of around four stops in our tests, the Tamron delivers brilliantly sharp handheld shots. And while the autofocus system is extremely fast, it’s also consistently accurate and dependable. The Tamron beats Sigma’s competing 100-400mm lens for centre-sharpness but sharpness is retained quite so well across the whole image frame. Unlike with the Sigma lens, Tamron offers an optional tripod mounting ring, although it’s typically pricey. Contrast is very good throughout the zoom range, even when shooting at the widest available apertures. As usual for current super-tele zooms, the widest aperture on offer at the long end of the zoom range is f/6.3, but the lens can still autofocus with Tamron’s 1.4x teleconverter, at least on cameras that support autofocus at f/8. Sharpness is excellent in the central region of the frame but drops off in the corners. (Nearer 0 is better) There’s barely any colour fringing at any combination of zoom setting and aperture. (Nearer 0 is better) Pincushion distortion is negligible at 100mm, and remains minor at longer focal lengths.